Earlier this year, Facebook said that they now have 1.11 billion people using the site each month and 665 million active users each day. Those numbers are astounding and those users can drive a large amount of traffic to your blog if you have a popular Facebook page. 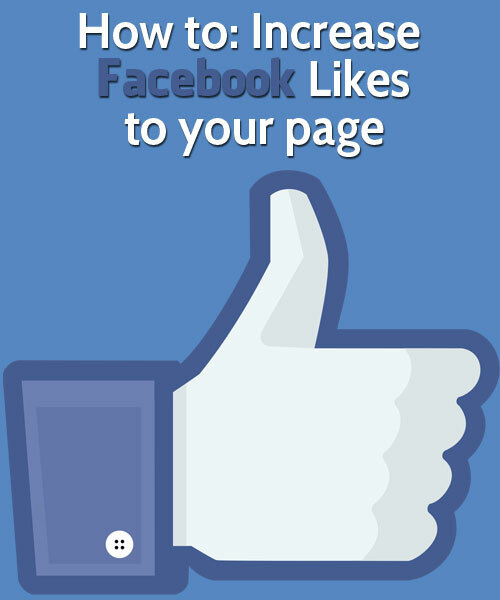 The more Likes you get to your Facebook page, the more people get exposed to your content. My first attempt at creating a Facebook page didn’t go so well. The Facebook page was for this blog, and for a number of reasons, didn’t grow and frankly failed pretty miserably. Since then, I’ve learned a great deal about how to be successful on Facebook and how to increase Facebook likes for your page. This article will share those insights with you, to help you take your Facebook page to the next level. I recently started a website called Blue Ridge Mountain Life. We live in the heart of the Blue Ridge mountains, in Western North Carolina, and I thought it might be fun to share our adventures, stories, and pictures with others. My friend Charles, from Back Roads Living inspired me to start a Facebook page for it, as his page is incredibly popular. Due to my first failure, I was a little hesitant, but decided to try it anyway. Nothing ventured, nothing gained right? Fortunately this time, the Facebook page for Blue Ridge Mountain Life has been a huge success, and continues to experience very rapid growth. I started the Blue Ridge Mountain Life Facebook page on July 29th and as of right now the page is sitting at 4,045 Likes in less than two months! Needless to say, I’m still pretty surprised at how quickly the page grew, especially considering we started the website just a few days before! Here are the things that I’ve found to be critical in building a successful Facebook page and increasing Facebook likes on your page. One of the most important aspects of building a successful Facebook page is understanding your target audience. The audiences on different social media sites are often very different and enjoy different things. Understanding what they will like and what they won’t like can make or break your page before you even create it. I learned from trying to start my Side Income Blogging Facebook page, that the general Facebook population isn’t real interested in learning how to blog. For the Facebook audience, blogging is a niche topic. Sure, you can absolutely grow a successful page, but it will require a great deal of time, hard work and effort. However, I found that the audience that hangs out on Google+ is far more interested in blogging and thus my page on Google+ was far easier to build up. Don’t get me wrong, I’m all about hard work, but there is only so much time in the day, and promoting your site where you’re audience hangs out is the smartest thing to do. The general Facebook audience fortunately does seem to be very interested in the Blue Ridge Mountains, especially when beautiful pictures of the Blue Ridge are posted. These pictures seem to be popular, and result in a large number of likes, shares, and engagement via comments. Higher numbers of likes, shares, and engagement cause Facebook’s EdgeRank algorithm to show those posts even more, resulting in more likes, shares an engagement. If you aren’t sure whether your Facebook page idea would do well or not, skim through the top 100 Facebook pages, and see what types of pages and topics are popular. I tried all of these content types during our first few weeks, and paid attention to Facebook Insights to determine which types of posts are most successful. Photos by far are the most popular. Posting a beautiful picture of a mountain view, old cabin, or waterfall did the best for us. Something that surprised me was that pictures of old 1800s log cabins were very popular and thus I started posting more of them. Next were text or content posts, especially when a question was asked, followed by video and finally links. Links of course drive traffic to your site, and unfortunately are the least liked and shared posts. Just a simple post like: “What’s your favorite place in the Blue Ridge?” can generated a great deal of engagement. I’ve done a little research, and this order of popularity for post types is pretty common across all Facebook pages. Of course all types are valuable and have their purpose. Also, for variety purposes, you’ll want to share all four types, but focusing on photos is your best bet for rapid growth. Pro Tip: Facebook will let you post a photo and include a link in the text. This allows you to share both a photo and a link our to your blog. This is the very best option, and the times when I’ve done this, I received both lots of like and shares and click throughs to our blog pages. As with pretty much anything, you’ll want to provide value to your followers. If you provide value, those readers will like and share your content with their followers, and those people then begin to follow you. The growth almost becomes exponential once you start getting a large number of likes and shares. If you don’t provide value though, you will get little to no activity. In order to provide value, you must first understand your audience and know what types of post content your audience favors. Use your first few weeks to try various types of posts and continue constantly experimenting and trying new things. I personally thought this was hilarious, but our followers either didn’t find it funny, or failed to see the humor in it. The photo received very few likes. 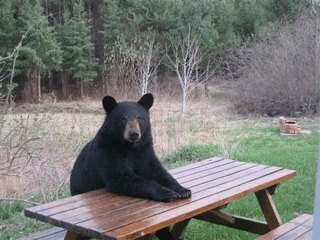 I’ve tried a few other “funny” type posts, and they just don’t do well on our page. 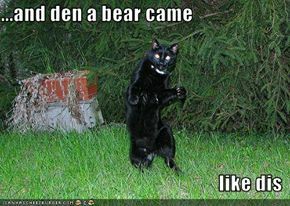 So I don’t post a great deal of humor type images. This post went viral. People had a blast coming up with creative and funny captions AND it got re-shared on a few other large Facebook pages. I’ve done a few other “Caption this” posts and all have done very very well. These aren’t posts I use often, maybe once a week, but when I do use them, they are always popular and we gain a number of new followers from them. Plus they’re just fun. I love reading the creative captions people come up with. Related to providing value is understanding the age and gender of your audience. Understanding these two factors will help you make decisions about what content will be enjoyed and what content won’t. Fortunately Facebook Insights will tell you this. Use this information, it’s very valuable and will help you curate content that is targeted right at your followers. The majority of followers for BRML are female and age 45 – 60 – I keep that data in mind every time I post. One of the primary reasons we saw the initial growth spurt was because I had built up a positive relationship with a few other bloggers that had large Facebook pages. These friends learned that I started a new Facebook page and shared some of our early pictures and posts. Namely, the two primary pages were: Back Roads Living, and The Nerdy Farm Wife. Both have over 15,000 followers. I just can’t say thanks enough to both of them!! You make the other page owner aware of your page and content. Allows you to curate content and establish yourself as the premiere curator and sharing of content in your niche. Creating and fostering positive relationships with other Facebook page owners and bloggers in your niche and in niches related to your topic can go a long way in helping to increase Facebook likes on your page and helping to build up your blog. One of the really irritating things about Facebook that you’ll have to deal with is EdgeRank. EdgeRank is Facebook’s algorithm for determining how many of your followers see your posts. As we mentioned, Likes and Shares play a key role in this, as do comments. If your followers don’t like your content, share your content and don’t comment on your content, eventually they will not see it anymore. So encouraging engagement is critical. I’ve found that posting once every 1-2 hours from 9am – 9pm seems to be a good balance. I still get a high percentage of reach, meaning people are seeing my content, and also engagement through likes, shares and comments. Creating and growing a popular Facebook page isn’t difficult, but it does take a lot of work. I spend a great deal of time each week, usually on the weekends, finding beautiful images and content to share on my Facebook page. My wife and I also spend a great deal of time out taking our own photographs that we use as well. I also practice all of the strategies above each and everyday to continue that growth. BUT, I also continue to experiment to see what works and what doesn’t. Do these five things, and I guarantee you’ll increase Facebook likes on your page, and have a Facebook page that can and will drive a tremendous amount of valuable traffic to your blog! This is what it is all about. 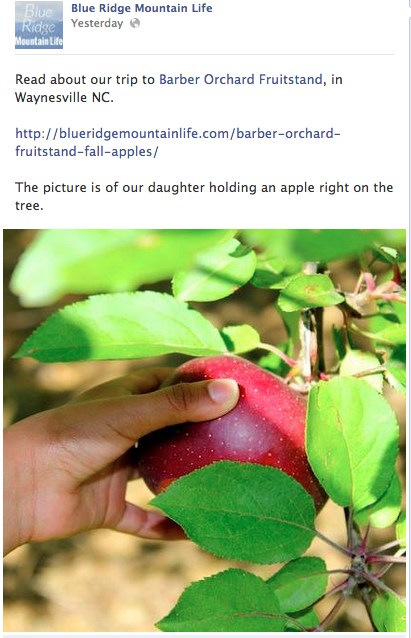 I am so glad you and Jenn created your Facebook Page for Blue Ridge Mountain Life. It has become a wonderful blessing to many! Your followers are so dedicated to you. Facebook can be a geat source of traffic for any blog but it takes a lot of time and hard work in making our presence felt on facebook. And you are right about facebook population not being much interested in blogging. Facebook is more of a personal social network while G+ is more business oriented. Thanks Larry for sharing this information. Thanks for the tips Larry! I am slowly trying to build mine and it’s hard! I have recently discovered though that building relationships with other page owners is KEY! And one mistake I made in the beginning was not posting enough. I just assumed that, the more you post the more FB hides your posts BUT I have found that opposite since I started my lil experiments about a week ago. I’ve started posting frequently AND I just barely discovered that FB had a scheduling option which has made my life easier. Now I just wish I can figure out the secret to getting the clicks and traffic over to my blog. Hey Melanie, you’re very welcome. I found the same about posting frequently, the more you post, the more people see your content. I noticed the scheduling option, but hadn’t used it yet, but I think that is a really great power user tip. If you figure out how to get them to click through, let me know, I have the same issue. Although, I have found that if you “tease them” and say “read the rest on our blog”, those tend to get more click throughs.